All kinds of Tikkas are very popular at almost all celebratory parties but especially when you want to enjoy barbeque weekends in the company of your friends and family. They pair well with all types of drinks. Today’s post is for those who love paneer. If you do not have a traditional tandoor then just bring out your grill pan or use your conventional oven to get it done. If you like your tikkas smoked then check out the Butter Chicken recipe. Have you tried my earlier tikka recipes? If not then do try Oven Baked Chicken Tikka & Chicken Tikka Biryani. 1 tsp. Garam Masala pwd. A pinch Black Pepper pwd. For Basting: Cooking Oil/Ghee or Butter – use as per choice. Soak wooden skewers in normal water for an hour. If the curds are not thick enough then bundle up the curds in muslin cloth or use a fine sieve/strainer to drain excess water. In a sufficiently large bowl, whisk the thick curds along with all the ingredients listed under the marinade to prepare a thick, well blended and smooth paste. Add the cubed paneer, vegetables and mix gently but thoroughly so as to coat well. Marinate for at least an hour. 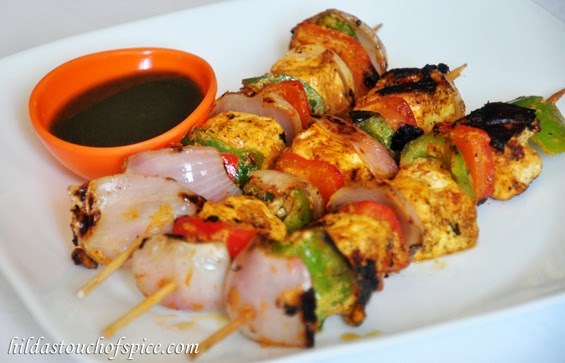 When ready to eat, skewer the marinated paneer pieces alternating with the vegetables. Grill the tikkas on a hot grill pan/ charcoal grill/gas tandoor/ or in the oven. Regulate and adjust the heat to maintain uniform grilling. Use a pastry brush to baste lightly with oil but use oil sparingly to retain moisture in the paneer and vegetables. Turn/flip the skewers after every few minutes so that the tikkas are cooked through evenly on all sides and charred lightly. Serve straight from the grill with your favorite chutney, dip or sauce with a squeeze of lime. Maintain uniformity in the size of paneer cubes & diced vegetables to get evenly cooked tikkas. For basting you may use oil of your choice/ ghee or butter. Instead of making your own tandoori mix with the powders listed in the marinade above, you can substitute with ready to use tandoori masala. You may use vegetables of your choice. Always taste to check seasoning. It is better to use less salt and adjust if necessary.